I did it! I actually tie dyed something! Alert the media! Though this upcycled thrift store skirt isn't everything I had in my mind's eye, I think I'm on to something fun. I plan to explore this idea further. Creativity is a process and we can't be worried about getting everything right on the first try, because that's bound to be disappointing. I don't believe in "craft fails" as much as I believe in craftortunities. With a little work and some more fine tuning, these bulls eye style tie dye flowers could be very, very cool. 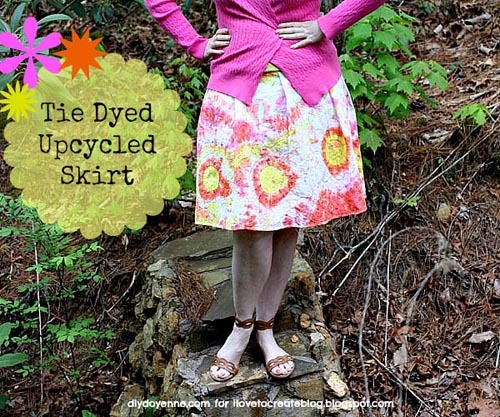 It's my goal to take tie dye into a new direction over the next few months and these saturated, colorful, fabulous Tulip dyes are the perfect way to do that. 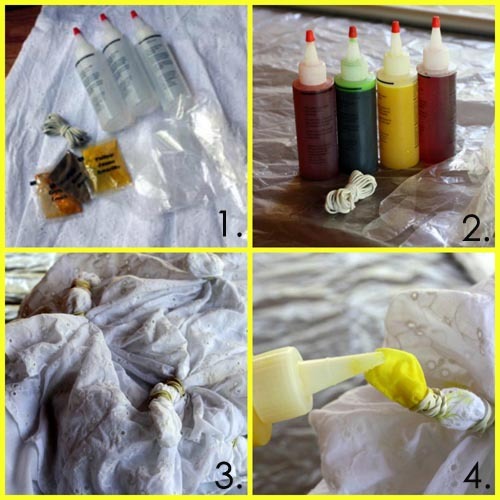 They have made it so easy to tie dye, anyone can do it, even me! 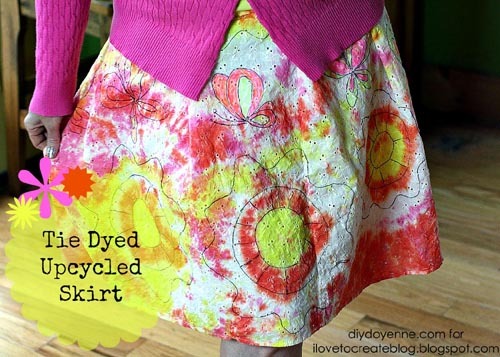 Read on to find out how I turned a $2.00 thrift store white eyelet skirt into a vibrant tie dyed creation. 1. Gather your materials, be ready to rock and roll before you add water and mix the dyes. WASH skirt to remove sizing or fabric softener. 2. Follow instructions to mix. 3. Wet skirt before dyeing. Tie off skirt by grasping and twisting small sections, band, twist again and band. Repeat to make these small twisted sections across bottom of skirt. 4. Add lighter dye to center of each section. 5. Add orange to bottom sections. 6. Wrap entire skirt up with more rubber bands and add pink. Wash and dry following instructions. 7. Grab some markers! 8. Turn bulls eye sections into flowers using black marker. Add some butterflies if you like too! Next time, I'm thinking of dyeing the fabric a soft color first, then doing a monochromatic tie dye. I may go back and over dye this skirt pale pink. I'm also visualizing just the flowers with out any extra dye or patterns around them so they create fun and colorful splashes of color on a blank white canvas. I'm also thinking of using the resist dye to prevent the dye from getting anywhere I don't want it to be. Are you a tie dye fan? 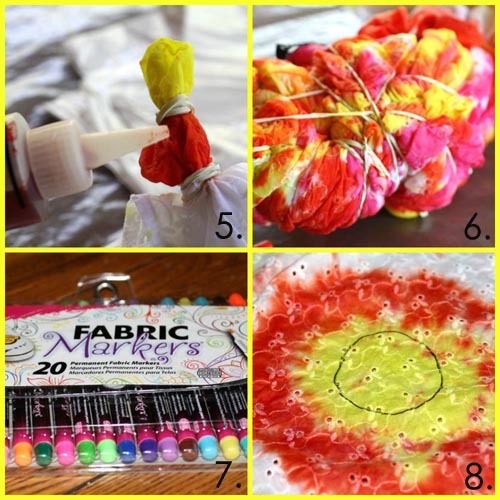 What kinds of tie dyed projects would you like to see? Do tell! Visit iLoveToCreate.com and DIY Doyenne to find more DIY, style and fashion inspiration. Can I ask what make of markers you use as the ones I have seem to spread/bleed uncontrolably and I am terrified of them! And also, I have the same question about the markers. The ones I've tried, don't stay on after washing, even when heat-set. Same thing with stamping ink. Rachael I use Tulip Fabric Markers, they're designed for fabrics! I love playing with thrift shop finds too, that way if things don't work out perfectly, you can cut them up or rework them and it's not a bank breaker!